If you don’t remember anything else during your time here in seminary, I want you to remember these two things for the rest of your life: number one – There is a place in God’s heart that only you can fill; number two – There is something that you are called to do that you cannot do without the help of the Holy Spirit. Well I’ve forgotten a few things I’m sure and with the help of notes and textbooks I’ve remembered other things, but those two statements have kept coming back over and over. As I look back, however, I have come to realize that he was only reiterating something that I had already known and been taught ever since I’d sensed the call to ministry that would take me to the pastorate. They were instilled in me by my loved ones, but especially my Papaw & Granny. Five and a half years prior, right around my 17th birthday, about half the age I am now, I had broken the news to my family that I had sensed the call of God upon my life into ministry and that I intended to follow that call. I shared this over dinner (where I grew up, that’s the big meal in the middle of the day that others call ‘lunch’) that was our custom on every Sunday after church at Papaw & Granny’s house, just a few hundred feet from our church in Oscar, Kentucky. Just remember, always, that nothing can happen to you in life – no setback, no disappointment, no temptation – nothing that you & God together can not handle. Papaw’s life and teaching exemplified to the nth degree the value of a life of humility and acknowledging that life’s fulfillment is found in depending on the Lord to live into God’s purpose for our lives and to make it through the most difficult of times. There have been plenty of setbacks, several disappointments, and a multitude of temptations, many to which I have fallen prey. But every victory, lesson, and new beginning have been because of the help, saving help, of God’s Spirit. I’ve held onto that letter Papaw wrote. It was the last one he addressed to me. He died six months later. And then there’s Granny (right), who I’ve known my whole life to be filled with infectious joy that manifested itself in her seemingly incessant singing. That’s a trait that has found its way into my ministry as those who are burdened with the task of listening to my preaching can attest when all of a sudden I break into song. I shared this with her on my last visit to see her before she died earlier this year. In recent years, the smile became rarer and rarer, but one adorned her face that day. That’s how I’ll remember her! There is a special place in my heart just for you. With each child, and son- or daughter-in-law, with each grandchild, and expansion of the family with more weddings, and with every great-grandchild that arrived in our family, we saw Granny’s heart grow. And so, I believe, it is with God. With every new creation, with each bundle of joy, with every masterpiece, we see another chamber of the heart of God. In this small, yet significant, way Granny gave me a picture of the loving God who prepares a place for each of us. There is something you are called to do that you cannot do without the help of the Holy Spirit. And that’s grace enough to carry us the rest of the way. I’ll never forget the first and only time I was referred to as a “fine young chap.” I was sitting up in the balcony with a few friends at Barlow United Methodist Church during a cluster revival meeting of the UMCs of Ballard County, Kentucky. The visiting preacher had this very distinguished British accent with an inviting tone and compelling stories that drew his audience (or at least me) in to try to capture the vivid details and concepts he was portraying. The visiting preacher’s name was Dr. Reginald Mallett and he was from England. Unlike most ministers with the prescript “Dr.”, Dr. Mallett was a medical physician, not a doctorate by means of a Ph.D.
After the service was over, I went down to shake his hand upon my departure, and he said, “Oh, you were one of the attentive fine young chaps in the balcony today! I hope you will come to some more services during the week.” That is what I just did. I took in every message and found myself compelled and confirmed in my recent direction to answer the call to ministry I had been perceiving. I found his sermon delivery very appealing as he would repeat the same Scriptural text or line from a hymn to serve as transitions throughout his sermons. This is a practice I have employed as well, though at times I perceive I have much growing to do in making the transitional phrases flow much smoother. Something about that story communicated to me the significance of the promise of a coming ruler who would reign more like a humble shepherd who was willing to put his life at risk to save and take to safety an entangled sheep than a domineering sovereign who would overpower his unruly subjects. Tangled and torn? The shepherd who is the prince of peace is on the way! Many readers of this blog, friends of mine in person and on facebook, and followers from twitter are aware of the educational journey I have been on for the past 3+ years in pursuit of a PhD in Wesley Studies at Nazarene Theological College (NTC), whose degrees are conferred by the University of Manchester in the United Kingdom. Several of my classes in seminary at Asbury, from which I graduated in 2006, centered upon the theology of the atonement, and this drove me to investigate the doctrine of the atonement in the theology of John Wesley. In January 2009, after a couple of years getting acquainted to fatherhood in the arrival of Sam into our family, discerning the specific topic I wanted to pursue in my doctoral research, and applying and being accepted into NTC’s PhD program, I began fully investigating this issue, focusing in particular on how Wesley’s atonement theology stood in line or at odds with the diverse theological tradition of the Church of England, in which he was raised, ordained, and remained faithful as clergyman until his death. Well, it is with a great deal of sadness but also a great sense of peace that I announce that my pursuit of this degree has come to an end. Although the crayons started making a few subtle marks on the wall a little over a year ago, it really didn’t become fully evident that the end was near until a couple of months ago. The weight of the question hit me like a load of bricks and after a very long pause where I felt like I was holding my breath, Carrie asked if I was still awake and still thinking about the question. I chuckled a little, said “Yes, I’m still awake” and then began weeping. Here I was in a home (parsonage) that was still quite new, in a community I hardly knew at all, away from most of my dear friends who have been alongside of me during this entire educational journey. Of course, I knew I didn’t have to answer the question right then and there in the middle of the night, but I already had the suspicion that the time had come for me to shut the door on this dream/wish I had been pursuing. Since my district superintendent was on leave for the month of July and I didn’t want to make a decision that might have some bearing on my ordination process, I decided to devote my prayers for the remainder of the month for God’s clear direction, my calling and investigating the desires of my heart. Carrie and I asked a few close friends to join us in these prayers, which they did. During that time, my suspicions were confirmed and I began making the necessary appointments and having conversations with the folks who needed to be made more aware or would be directly affected by such a decision. These conversations took place over the course of the month of August. What was great about all of these meetings and discussions was that everyone wanted to make sure that I wasn’t being forced out of this against my wishes by external forces like financial limitations, travel/time-off restrictions, or limited accessibility to the research resources that would be needed to support the argument(s) I was seeking to make. But what was also communicated to me was that they had my support regardless of the decision I made as I was seeking the will of God in doing what was best for me and my family. To everyone reading this who offered that support either explicitly or implicitly, I deeply feel your prayerful encouragement and advocacy as I have gone through this sort of grieving process on the closure of this endeavor I was pursuing. Two main questions have risen to the surface in the wake of my decision to withdraw from the PhD program and pursuit: 1. What should/can I do with the research and writing I have done to date in the program? 2. What, if anything, is next on the educational front? With regard to the former, one of my causes for hesitating on this decision was the fear that the work I’ve done in researching and writing on the atonement in the past few years would go to waste if I didn’t go on and complete the dissertation/thesis. I don’t want that to be the case, but want to contribute to the field of Wesleyan theology or to find a way to adapt the writing to make it accessible more for a lay and/or pastoral audience. To that end, I’m going to spend some time in organizing the work into something cohesive to submit it to a scholarly journal for hopeful publication or develop a primer or short book on the atonement from a Wesleyan theological perspective. The answer to the second question depends on what directions are given to me by the Board of Ordained Ministry as I apply for provisional membership in pursuit of ordination as elder. To be ordained as an elder in The United Methodist Church, the Book of Discipline requires the ordinand complete a Master of Divinity (MDiv) or its equivalent. My masters degree at Asbury Seminary was a Master of Arts in Theological Studies and was a few hours shy of a full MDiv. So it all will depend on how I respond to the questions as I am interviewed by the Board of Ordained Ministry and their evaluation of my transcripts as to what additional coursework would be deemed necessary so that my education would qualify as the “equivalent” of MDiv. So both you and I will have to stay tuned on this front. Thanks for reading! And if you have suggestions or questions, please comment or ask me! If anyone I’ve ever known fit the bill for what John Wesley described as entire sanctification, it would be my Papaw (pronounced “paw paw”). Papaw loved the Lord his God with all his heart, mind, soul, and strength and loved his neighbor as himself. Those who will have the burden of hearing me preach will doubtless hear many examples of how important this man has been in my life. Papaw died in 1998 and I miss him still. 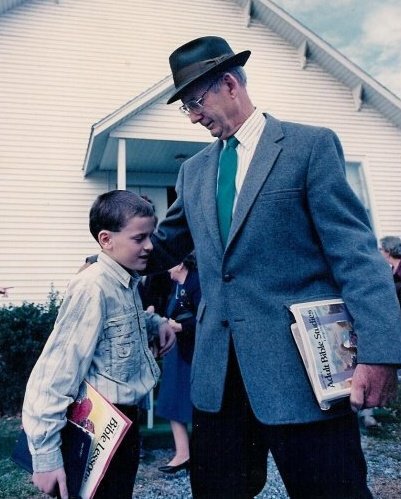 One of Papaw’s spiritual gifts was that of encouragement. Being a recipient of God’s grace throughout his life and of generous support from his community during a difficult financial time, I witnessed Papaw give public and private support to others in a variety of ways in their time of need. One way his gift of encouragement manifested itself was in his craft of writing letters by hand. I was the recipient of such a letter after announcing to my family my intentions to enter into the ministry. I had just turned seventeen years old and declared these intentions at our usual family dinner (or you may call it lunch, depending on which sub-culture you live in) after church one Sunday. Later that week, I received a letter in the mail, which is pictured at the bottom of this post (in the caption is the letter’s contents, in case it’s illegible to you). 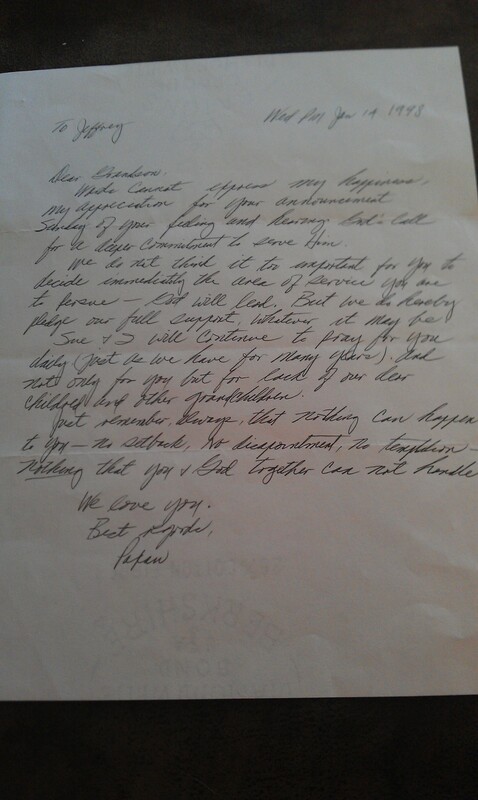 This letter was the last one I received from him before his death later that year. I share this letter with you because I have found myself opening this letter time and time again, not only for the sake of the fact that it was his last letter to me, but because of its rich and rather prophetic content. His words have proven true as my vocational journey has taken its interesting yet subtle twists and turns these last fourteen years. In particular, his affirming words that God would lead as I would pursue the area of service to which God was calling me and the final statement reminding of God’s presence with me come what may, have become etched in my memory. I think you might find his words could be applied more broadly as well, so I hope these words will encourage you! Words cannot express my happiness, my appreciation for your announcement Sunday of your feeling and hearing God’s call for a deeper commitment to serve Him. We do not think it too important for you to decide immediately the area of service you are to pursue – God will lead. But we do hereby pledge our full support, whatever it may be. 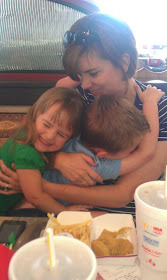 Sue & I will continue to pray for you daily (just as we have for many years). And not only for you but for each of our dear children and other grandchildren. Just remember, always, that nothing can happen to you – no setback, no disappointment, no temptation – nothing that you & God together can not handle.